getcalc.com's Basal Metabolic Rate (BMR) Calculator is an online health & fitness tool to estimate how much amount of calories burnt per day, by the human system for the up-keeping of respiratory, circulatory, digesting, immune, nervous, muscular, reproductive & urinary systems etc. to plan for diet, fitness & healthy living. Basal Metabolic Rate often abbreviated as BMR, also known as metabolism rate, is amount of calories burnt when individual is resting without any physical activity. 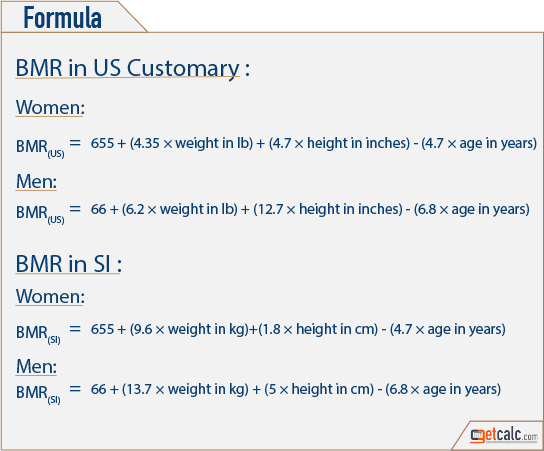 BMR value is calculated by individual's gender, age, height and weight. Basal metabolic rate (BMR) affects the rate that an individual burns calories and ultimately whether that individual maintains, gains, or loses weight.